"The next day we set off to explore, using the buddy system for safety. Several of us set up at Grande Chute while others canoed further down Robinson Lake to the next set of rapids. The river trail along the Chute is rough, and has spectacular rock falls with some boulders the size of small houses. One could only imagine what the people travelling in this area felt thousands of years ago. Like us they must have been in awe of the power of the water and like us they also feared the churning rapids – and one could only wonder how many travellers have been swept away by the swirling currents. 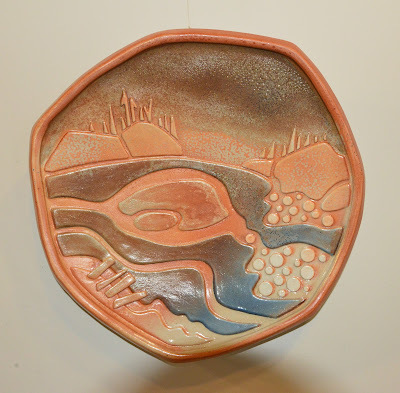 "Hear the Rapids Roar" wall plate by Eva Gallagher inspired by stay at Dumoine River Art Camp. Photo credit - Scott Haig 2017. In the evening we sat around the campfire and traded stories of canoe trips and art experiences. We also discussed Wally Schaber’s book on the Dumoine, “The Last of the Wild Rivers” and how important the River was to First Nations people as a north/south highway. 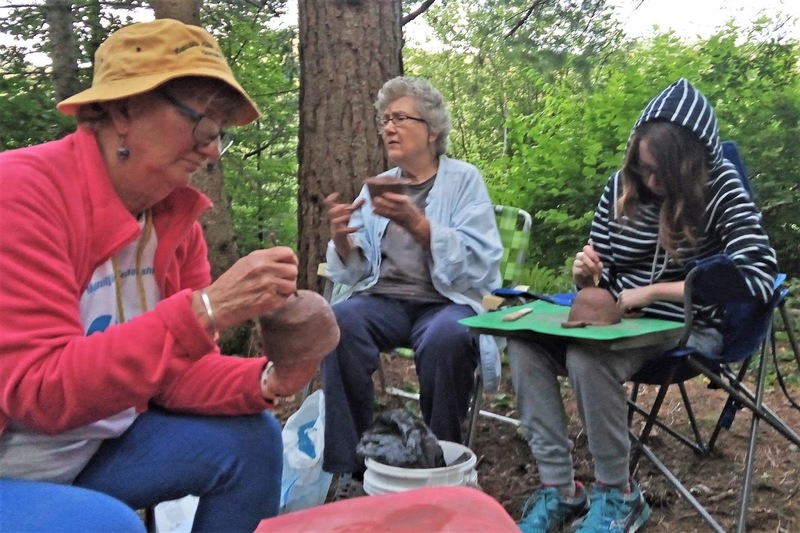 I had brought clay for everyone to make a pot the way the aboriginal people made them here thousands of years ago as evidenced by the “Indian Point Pot”. Radiocarbon dated at 2500 years BP (before present), it was excavated during an archaeological dig at Indian Point across from Deep River in the early 1950’s and is now on display at the Museum of Civilization in Ottawa. One evening we sat around the fire, surrounded by the dark forest and silence, channeling spirits from the past. We coiled the clay into a beehive shape that was then turned over and pinched, paddled and scraped into a thin open vase. It could have been an evening thousands of years ago, our hands repeating the same motions made millennia ago and resulting in pots very similar to the Indian Point Pot – with a flared lip and a rounded bottom to better withstand the thermal shock of cooking over open fires. Eva Gallagher (center) demonstrates how First Nations first made pottery in this area thousands of years ago. Photo credit Scott Haig 2017. I came back from the camp energized, ready to continue working on several pieces that I had started at the camp. In October CPAWS hosted a very successful gala and silent auction of the donated art in Gatineau at “The Moore Farm”, a National Capitol Region restored post and beam barn that is open to hosting various events. With featured guests, singer/songwriter Ian Tamblyn, artist/environmentalist Robert Bateman, the event raised over $11,000 for the Dumoine River project." The idea of an art camp - that idea of bringing together artists to work on a common theme are becoming more popular and I highly recommentd this type of experience . Hopefully CPAWS is going to offer another Dumoine Art Camp in August 2019 so in interested look to apply early in the spring.of 2019. Again I am way behind in my blogging so here's my effort to catch up by reprinting an article that I wrote about the Dumoine River Art Camp last August 2017. - my first art camp experience! The Dumoine River is a famous canoeing river that joins the Ottawa River about 20 miles west of Deep River. My article was first printed in our local paper the North Renfrew Times last year. "Mention the Dumoine River and it conjures up scenes of rapids, lakes, canoe paddles and portages. But art? Not so much! 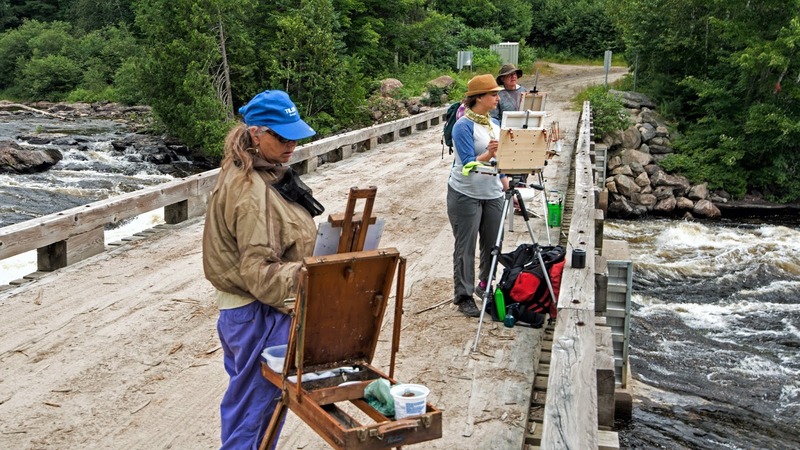 But that is what The Canadian Parks and Wilderness Society – Ottawa Chapter (CPAWS-OV) was offering to artists last August – an Art Camp on the Dumoine. There was one this year as well! In return for offering free tent accommodation and meals (CPAWS staff turned out to be excellent cooks! ), the artist would get to stay for up to 6 days at the camp. They would then donate a work of art, inspired by their stay, for a silent auction at a gala in Ottawa in October. Here was an chance to meet other creative people in a unique environment. Always open to new artistic opportunities I applied as the life of an artist is not a destination but a journey. We were to camp at Lake Robinson, that widening of the Dumoine River just below Grande Chute. To minimize parking, we met up in Swisha to carpool to the Lake. Kids leaving for their first summer camp couldn’t have been more excited than our group! It was a challenge to load all our sleeping bags and mats, folding chairs, boxes and suitcases of art supplies, easels, cameras, and tripods, including my box of clay and tools into the few cars that would be driving up the rough road. Although it has been many years since I have been up the Dumoine, I still remember that first drive over 50 years ago – up along the rough road past the old Bonanza Inn and the long-closed downhill ski hill and tow on the hill opposite. It was always an adventure there to drive into the unknown, but one always had to be wary of meeting a fully loaded lumber truck that might come around the corner. One year we even skied to Grand Chute after driving part of the way. The fifteen artists who attended were a pretty diverse group, not only in age, spanning six decades – but also in artistic media. There were several photographers, a glass artist, botanical illustrators, acrylic and watercolour artists, both realistic and abstract and of course potters. We came from as far away as North Bay, Vankleek Hill, Ottawa, Pembroke, Shawville and southern Ontario. There were two of us from Deep River, photographer Bruce Winterbon and myself. As part of our orientation, one of the CPAWS staff – conservation biologist Elena Kreuzberg took us on a nature tour. The Dumoine watershed is huge, covering 4400 km2 with some of the last remaining stands of old-growth forest in eastern North America. The area is also important as a connection between Algonquin and La Vérendryer Parks, acting as a corridor for animals moving further north from southern areas. This will be even more important as the climate continues to get warmer." I see that two years ago in Jan 2015 I wished everyone that creative high - the joy of making. Well for 2016 I really needed to wish that for myself. as this past year has been a very slow year creatively speaking. I feel like I am wading though deep mud or snow, with new ideas stuck and I have had to really struggle to get them out. I will give myself another week to clean up my work space in the basement - it is really cluttered with too many things that need to be thrown out. After that I will start sketching again - it is the best way to generate new ideas - and then hopefully there will be a rebirth of new ideas. One idea that I plan to pursue is getting impressions from germinating seeds. This little tea bag rest (above) embodies a fresh start, a new beginning - it was a serendipidous event! In 2015 I had collected lots of wheat stalks from the Saskatchewan farm where my son and his wife were married. 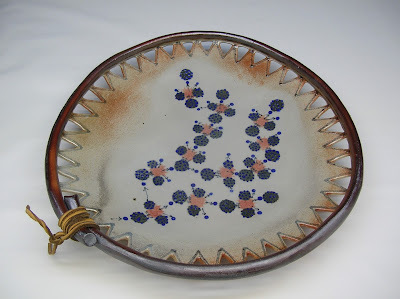 I made a platter with wheat stalk impressions on it as a wedding present. Several days after impressing the clay I noticed that a seed had fallen from a stalk head and was germinating in a little pool of water by the sink where the tap was leaking. I decided to impress it into clay. 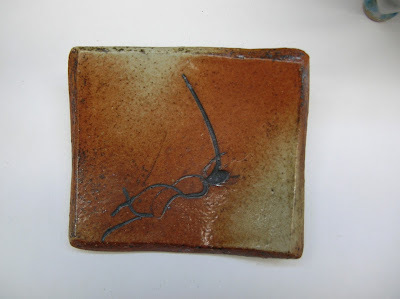 Once tile was bisqued it was brushed with gosu slip and wiped off and then glazed with Malcolm Davis shino and a little spray of magnesia mat glaze. It was amazing the details that showed up - even the very fine roots. I will have to visit the local farm supply store soon as I think that a platter with rows of different seeds germinating - wheat, oats, peas, corn, etc, would make an interesting piece - and with it symbolizing a rebirth of creativity. Happy new year! As 2016 winds down I realize that if I want to record the significant pottery events that happened this year I really do not have much time left - so here goes! What happens when the oldest potters’ guild in Canada meets with the newest? 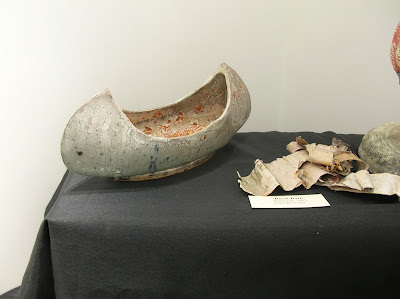 The Canoe Culture collaborative project! 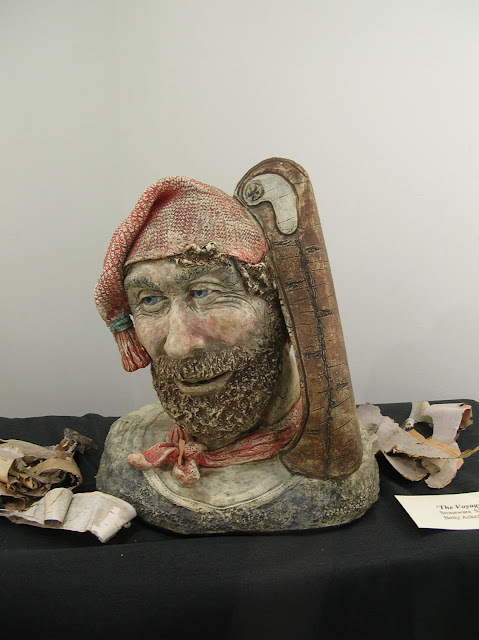 In 2014 the Deep River Potters Guild (1954) was contacted by North Bay artist Dermot Wilson, who shared with us the great news that they had just formed a potters’ guild in North Bay! And would we be interested in collaborating on a series of workshops and exhibits? Dermot successfully applied for an Ontario Arts Council grant to help pay for the project and the Canoe Culture project was born. 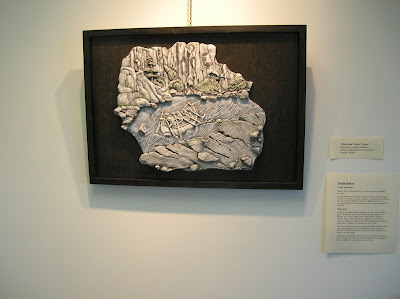 Its theme is based on the historic Ottawa River to North Bay paddle path used for thousands of years by North America's First Nation inhabitants and then by the voyageurs and settlers who followed in their wake. 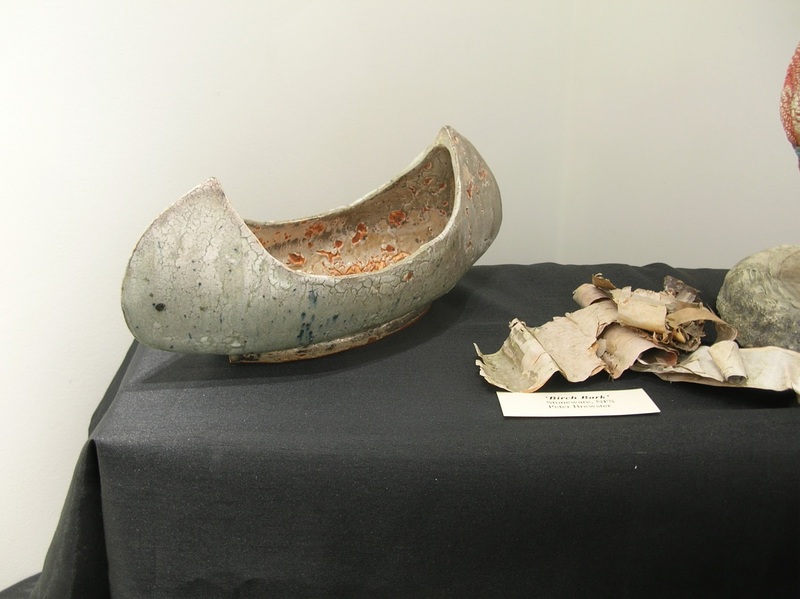 The project brought together ceramic artists from our two communities in near-northern Ontario. How does the water route and history shape our vision of our sense of place? What do we see and feel when we look out over the river, when we go to the beach, or go out in our boats? 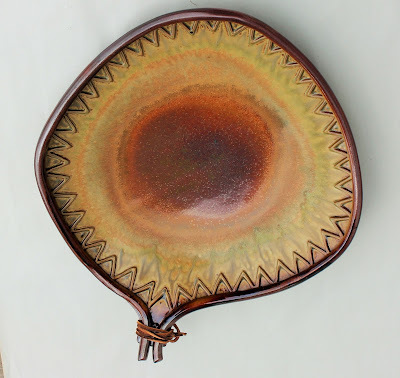 The project included a series of hands-on pottery workshops. In the spring of 2015, North Bay potter Keith Campbell, gave a workshop in Deep River and Eva Gallagher, Ligita Gulens and Marg Killey reciprocated in the fall in North Bay, exchanging ideas, techniques and enthusiasm. The project culminated with two month-long exhibitions of ceramic works created especially for this project The exhibits were juried by Pat Stamp, a North Bay potter, Cathy Walsh, a Deep River artist and retired Mackenzie High School art teacher and Dermot Wilson. 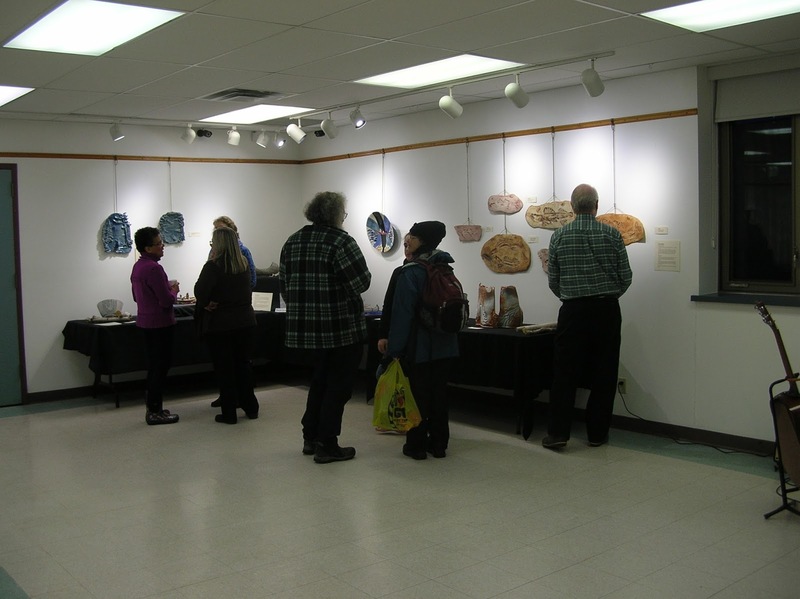 The 16 artist show opened in North Bay in mid November 2015 at the Whitewater Gallery and in April in the Program Room of the Deep River Public Library. 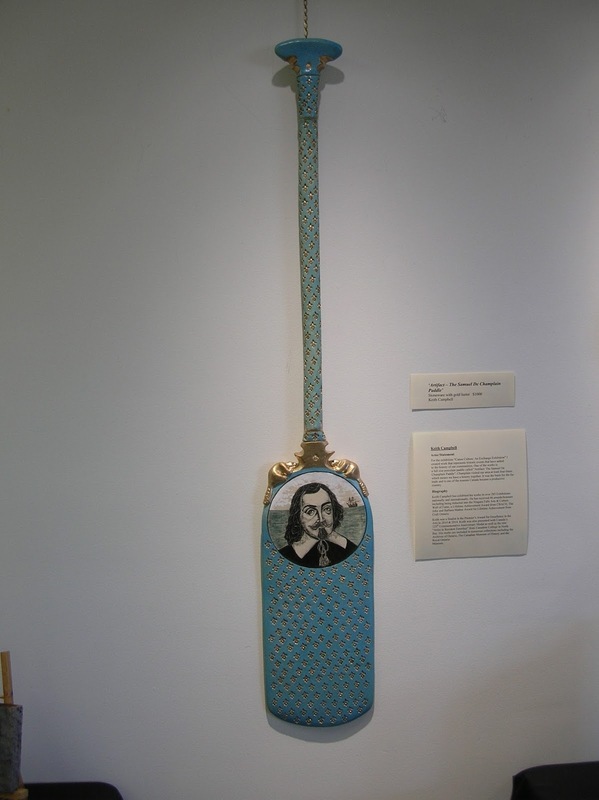 The potter works ranged from canoes, the fur trade, a paddle, clay fish impressions to more absrtact ideas such as stretched beaver pelts and crows (representing the Jesuit missionaries). Unfortunately I do not have many pictures of the exhibits, but below are a few that I did mange to take of some of the other artist's works. "I am a Deep River gal, born and bred, and I love this land. I love the granite outcroppings and the abundant fresh water in the glorious Ottawa River, lakes, streams and wetlands. I love the tall pines and the mixed deciduous/coniferous forest and I have a deep understanding of the complexities of this ecosystem - what lives here and why, from the bedrock to the tips of the tallest tree. I spend time outside every day, just soaking up the beauty of this habitat, this land, and feeling profoundly grateful that I live here. This is home, in all its extreme seasonal changes, and I feel connected to this land; it is part of me. When I travel, I carry pieces of the land with me, like talismen, to remind me of where I come from and to call me home. There are several pocket rocks that have traveled thousands of miles with me and in recent years, I have also carried a mug from home. There is such comfort in starting each day, even in a far away land, with a cup of tea in a familiar and beloved mug. I have a favourite mug, crafted by Eva Gallagher, which captures a sense of the river, the Laurentian Lowlands and the trees and it has become my "traveling mug". The mug has accompanied me on trips to Bolivia (La Paz, Rurrenbacque jungle, El Choro mountain trek), Costa Rica (Playa Guiones), Nicaragua (Ometepe Island), North Carolina, St Joe's Island, and Pukaskwa Park on Lake Superior, Prince Edward Island (all over), New Brunswick (Douglas), and countless shorter trips around Ontario by plane, train, car, canoe and kayak. It fits securely in the cup holder of my car and happily holds a Tim Horton's medium. I bought the mug at the Valley Artisans Coop a few years ago because it met my criteria - sit comfortably in my hand with good balance and with a pleasing colour palette. I prefer a slim profile in a mug since I hold it by the body instead of the handle. One day, in the fall of 2015, after dropping my son at school, I was driving along the waterfront near Centennial Rock, sipping tea from said mug, and was literally stopped dead in my tracks. The sunlight on the hills across the river, the colour palette of that breathtaking scenery was exactly what I held in my hand, on my mug. I pulled into the Centennial Rock parking area and got out, held the cup up in front of me and took a picture (or 10). 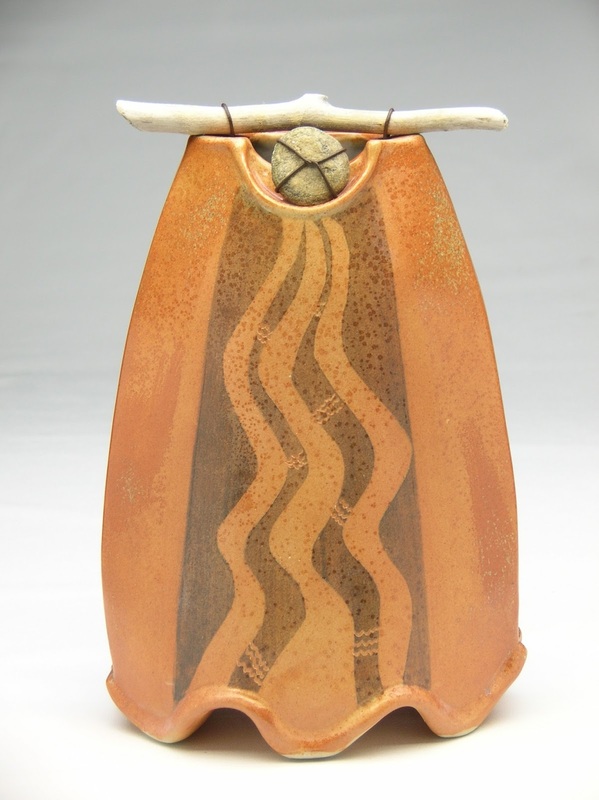 Eva had captured the spirit of the river perfectly in the form and colour of the mug. Beautiful! Last week, I was in the Potter's Guild, looking out the lovely new windows towards the river and was struck anew of how well this mug captures the essence of Deep River. The Ottawa River is the heart of this community, it defines the landscape, it pulls me home and with this mug, I carry a piece of that wherever I go. Every day I am struck by the beauty that surrounds me in Deep River and I pause to appreciate the details of the perfection: frost designs on puddles and leaves, dew drops on spiderwebs, fog in the marina, rainbows, sundogs, sparkling snow sculptures. I am grateful for artistic skill which can capture the beauty in a functional and fabulous form. Inspiring words Anne - and have a wonderful trip! Deep River is indeed a special place to live. Anne had ordered more of the same mugs to give to her sisters and friends so that they too can have a piece of Deep River and they have all become "Sisters of the Traveling Mug"! I decided to donate the proceeds from this commission for our new windows at the Guild - so we can all see that same million dollar view of the Ottawa River as we make and glaze our pots. 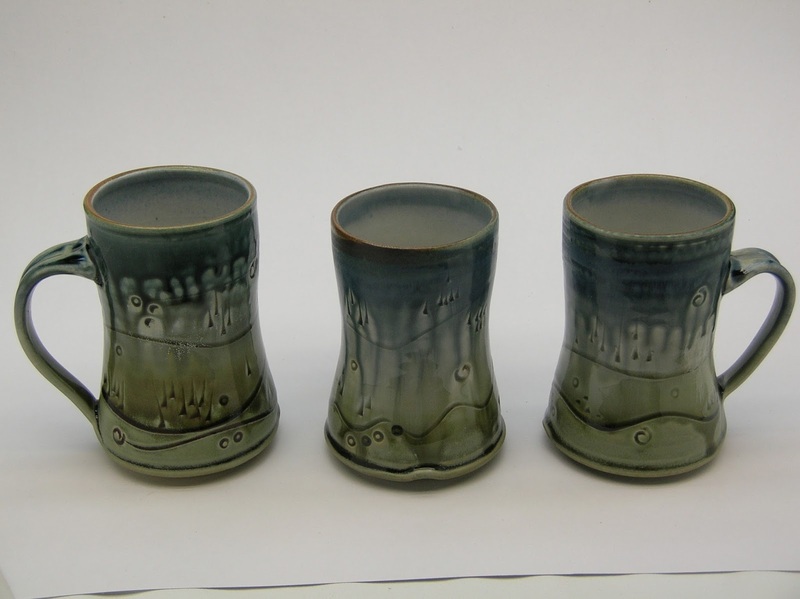 Three of the sisters of the "Travelling Mug"
The descending swirl in the cup design was inspired by courses that I took from Steven Hill and Nick Joerling. I then embellished them - I stamp on a few vertical lines with the end of a wooden stick and add stamped swirls. For glazing - first Watercolour Green is brushed on and rubbed off, staying only in the impressions. Then the bottom is dipped in a glaze that comes from cleaning out the spray booth - so will not be able to duplicate once I run out! I then brush on some Dan Hill Lithium Blue Slip, near the top and Strontium Crystal Magic near the middle. Then I spray with Hannah Blue Ash, Van Gilder Blue Ash near the top, a Magnesium Mat in the middle, and a very light spray of Aerni Ash (no colorants) on top half, an extremely runny ash glaze, just to ensure lots of movement. It is fired in reduction - gas kiln to cone 10. The last batch I found was not quite as pale yellow in the middle as the one Anne bought .It had more more grayish-white than yellow, but then over all the swirl lines were better. It takes a lot of practice to get things right! It's been a while since I have blogged but I am determined to give it another go to write more regularly - it really does motivate me to think about what I am creating and why. So another thank you to Anne - for giving me a reason to get back to blogging!